These healthy oatmeal muffins have very little added sugar and plenty of whole grains. Naturally gluten free, and kid approved! I love a good make-ahead gluten free breakfast. I just … do. Make my weekday mornings easier and I’ll love you forever. Today’s addition to the line-up is so simple, healthy and hearty that I predict it will quickly become a family favorite. I can’t even count how many times I’ve already made these naturally gluten free, easy oatmeal muffins. Just look at how few ingredients there are! A note about bananas: Bananas, like scallions, Bartlett pears and avocados, are ingredients that you have to catch at just the right moment or have them lost to you forever. I loathe throwing out food (who doesn’t?!). But I never, ever throw out bananas, now matter how many I buy. I buy a bunch, and the moment they reach peak ripeness (for me, that’s yellow with a few freckles), I get them ready for the freezer. I peel them, chop them into 1-inch chunks and freeze them in a single layer on a lined baking sheet. Then, I pile them into a zip-top bag and return them to the freezer. For a recipe that calls for mashed bananas, like this one, I either let the proper amount of bananas thaw at room temperature or I microwave them for about one minute at 60% power. Then, mash away! Not sure they’re as easy as I say? Push play ▶️ and see for yourself. These simple muffins are very adaptable. Swap out the virgin coconut oil for an equal amount, by weight, of butter (tried it; loved it) or vegetable shortening (tried it; loved it more with butter). I haven’t tried straight-up liquid oil, though, and I really don’t recommend even trying olive oil as the flavor is just too strong. You must use bananas, as they give the muffins sweetness and structure (applesauce won’t work properly). The dried fruit and/or coconut flakes can be substituted out for any sort of mix-in you like (chocolate chips?). Even the couple tablespoons of sugar can be left out. Imagine that! I’ve tried them both with and without the sugar. I certainly prefer them with it but it doesn’t affect the texture at all to leave it out. Preheat your oven to 350°F. Grease the wells of a standard 12-cup muffin tin and set it aside. In a large bowl, place the oats, coconut flakes, salt, cinnamon, optional sugar and dried fruit, and mix to combine well. Create a well in the center of the dry ingredients and add the coconut oil, mashed bananas and eggs, mixing to combine after each addition. The batter should be thick, but soft. Divide the batter evenly among the prepared wells of the muffin tin, and smooth the tops with a wet spoon or spatula. Place the tin in the center of the preheated oven and bake until the muffins feel firm when pressed gently in the center (about 20 minutes). Remove from the oven and allow to cool in the pan until firm (about 10 minutes) before transferring to a wire rack to cool completely. A toothpick or small offset spatula can be useful in removing the muffins from the wells. Serve immediately or wrap tightly and store at room temperature for up to 3 days or in the freezer for longer storage. Defrost in the refrigerator overnight or at room temperature before serving. Recipe originally published on the blog in 2015. Recipe amounts scaled up slightly, recipe otherwise unchanged. Photos and video all new. 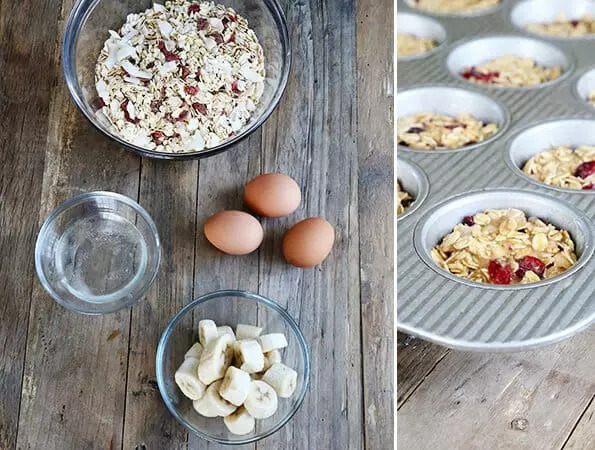 Nicole, these sound fabulous and I would love to try them but I am vegan, can I just add more mashed bananas in place of the 4 eggs? I wonder if you could use flax “eggs” in place of regular eggs? These look amazing, Nicole. I wish there was a good substitute for banannas–they give me instant migraines–but I haven’t heard of one yet. :( But my grandkids would probably love these! Unsweetened apple sauce? I sometimes use grated apples, peel and all, for a natural sweetener. Not the same as bananas, but not too bad, either. I can’t help but wonder what apricots would taste like as an addition. Someone suggested apple sauce but Nicole said it wouldn’t work in this recipe. I never thought of apricots! Might be a good alternative. Guess you would have to mash them in a food processor? It is not clear to me what the mashed bananas are for–sweetener only or also for texture and binding. I will have to experiment with the recipe and see what happens. Mashed pears seem like another idea. I love your recipes; love getting your blog; have all your books! Do you think I could use date sugar in the muffins? It is icy here in Kansas City today and perfect muffin weather. Hi, my name is Rhianna and I live in Australia. Just would like to know where I can buy the gluten free rolled oats online? How “banana-ey” is the taste? Not very, Becky! If you’re concerned, try adding a dried fruit with a stronger taste—or substitute chocolate chips. And some vanilla extract! I haven’t, Carole, and it might alter the moisture balance in the recipe but it’s worth a shot! Nicole I absolutely hate banana’s, can I substitute with applesauce or something? I’m afraid not, Juanita! Applesauce will not serve the same function as mashed bananas. I’m going upstairs and make them now .. Have you ever used fresh fruit in them like maybe diced apples??? How about blueberries ??? My husband is going to love these, he’d eat muffins at every meal if I let him. Hello dear Nicole. I have your book, “G/F on a Shoestring” and am planning on treating myself to your “G/F OAS Bakes Bread. I have printed and also posted a bunch of your wonderful recipes on Pinterest, and I have a question about this particular one…..dried cranberries….sweetened, as in Craisins ? I know that you can buy some dried fruits unsweetened, but I’m not sure about cranberries. This sounds delish and I’m looking forward to trying them. Thank you so much for all of your hard work and dedication to helping us. God Bless you and your family. i am so mad at my banana’s! they are all green. i want to make these for a snack for when every ones hungry before supper but all i have is green banana’s! Can the coconut be “optional”? I’m not a fan of it at all. Sure, Sandy. As I mention in the post, you can swap that out, by weight, for another dry mix-in. I wish my kids ate like yours. I don’t know if mine would eat these – it makes me so sad. but speaking of dried cranberries – you know those starbuck cranberry bliss bars …. oh how I want one. BAD! Hmm, I wonder if cold oatmeal could be solidified and turned into something like a firm polenta cake. Browned in a pan, a little syrup on top. Now THAT I might eat. She’ll eat oatmeal that I’ve just made. And she’ll eat overnight slow cooker oatmeal—but only first thing, and not leftovers again the next day or anything. Okay I’m getting annoyed just thinking about it! I’ll gladly take your oatmeal! It can’t be wet and gloppy at all, though. I like it fairly dry. I really like it with a tbsp. of apple butter and a handful of walnuts mixed in. I think the Scottish used to do something like that. Let oatmeal solidify and then fry it like corn pone. Can you use an egg substitute like flax meal & water? I’m allergic to eggs, but these sound delish! I’m honestly not sure, Pam. There are 3 eggs in these, and I generally don’t recommend replacing eggs when there are that many in a recipe. Sorry! Here you list 3 eggs but the recipe says 4. I followed the redipe so hope it still turns out and not “too eggy”. Vivian, the comment above that you are quoting was written 2 years ago, before I republished this recipe. I scaled up the recipe a bit when I republished. It is correct as written, with 4 eggs. It was properly proportioned before as well, with 3 eggs, but made slightly smaller muffins. I, too, have bananas in the freezer! I have all the ingredients on hand to make these. Oh yeah baby! Oatmeal is my go to breakfast in the winter. This is just another lovely way for me to enjoy it. Nicole, I just appreciate you and what you do for us more and more each day! Mare – way too many bananas in my freezer too. way too many. We keep lots of banana in the freezer, too. They make smoothies so creamy! These muffins look so simple and delicious. Plenty of bananas in our freezer too for breakfast smoothies (yes even in winter), banana pancake muffins, banana pancakes, etc. Aw, you’re the best, Mare!